Planet Gun Dog is your one stop shop to buy or sell Dogs, Guns and all items associated with shooting. Do you have a kennel to sell? 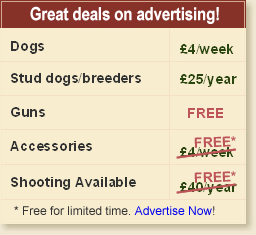 List your dog or a gun from just £4 per week. With nearly 50,000 page views a month your gundog will be seen by thousands of people. Create a free listing for your Gun Dog club and keep your members up to date with results and news and provide contact details. So what are you waiting for, if you have something to sell create your account now or start shopping!